Patrick Chinnery FMedSci is a clinical neurologist with a sub-specialist interest in neurogenetics. A Wellcome Trust Senior Fellow in Clinical Science since 2003, he has been studying the molecular and biochemical basis of mitochondrial disorders for over two decades. 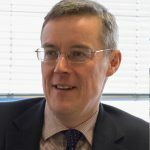 Until 2015 he was Director of the Institute of Genetic Medicine and NIHR Biomedical Research Centre at Newcastle University; he then moved to the University of Cambridge as Professor of Neurology and Head of the Department of Clinical Neurosciences. His research laboratory is within the MRC Mitochondrial Biology Unit. He is an NIHR Senior Investigator (2010), was awarded the Foulkes Foundation Medal by the Academy of Medical Sciences (2011), and is a corresponding fellow of the American Neurological Association. He is Chair of the Medical Research Council Neurosciences and Mental Health Board. He has published over 500 papers on genetic neurological and mitochondrial disorders, including the first randomised controlled trial showing treatment effects in a mitochondrial disease.